Earnings season is here again – and this quarter is going to be very different from what we have experienced over the last year. First, earnings growth rates have shrunk to a 10.6% estimated growth rate (according to Factset Earning Insight). Unlike prior quarters when every company was beating earnings, there will be more misses, but there will also be clear cut winners. So it is a fun quarter. Again, the headline number is looking solid at 10.6%, but this represents a steep drop from prior quarters where they were in the high teens, and 20’s. Those lofty rates could not continue forever, but during that period, it seemed like every company was beating estimates, and the market had a very reduced reward for beating estimates. In fact, two out of the three prior quarters, the average price impact of a positive earnings surprise was actually a slight decrease in price. Look for this to change back to a more positive reward this quarter. As analysts have begun focusing on troubled times ahead, they will pay even more attention to any forward guidance that a company releases. Any shaky guidance will lead to stock price drops immediately. The worries are definitely on the downside this quarter. Estimates have been coming down. 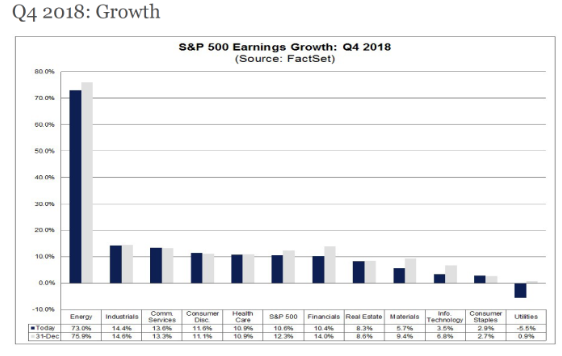 For example, in the last two weeks, the S&P 500 earnings estimate for this quarter has gone from a 12.6% growth rate to 10.6%. While it is normal to have some slippage, this is very fast slippage! Energy looks like a huge winner, but it is comparing to a low base last year, which magnifies the current growth rate. Industrials, Services and Consumer Discretionary on the other hand are solid numbers that indicate continued growth. On the other side, Utilities has had a great run, but they are going to slow down. Information Technology has seen their estimates really shrink in just the past two weeks. They are suffering from exchange rate issues, and trade wars problems, and this will be a continued picture in Q1 and 2 of 2019. In fact, Technology firms looks like the will be in the negative earnings growth area for these quarters. Forward Looking – any rainbows? Earnings growth is slowing down. Q1, 2019 is already projected to be down to 1.8% earnings growth over 2017 Q1. This number tends to go down as you exit the prior quarter’s earnings season, so this number could easily end up flat or even negative. Healthcare is considered the safest growth sector (projected to grow at 9%). On the other hand, Energy has dropped like a stone so far (dropping from 16% growth to slightly negative growth) which reflects the lower energy prices. Expect volatility – earnings will be under pressure and forward guidance could be rough for many companies. Avoid sectors that look like they are disappointing. As a trend emerges this quarter, adjust quickly. If one company disappoints in a Sector, other companies will likely follow suit. Expect companies that report good earnings to be rewarded much more than in past quarters. Expect the market to follow closely the overall tenor of earnings season. Earnings have been a consistent piece of good news, and if there is more weakness than expected, the market will suffer. For example, if earnings come in under 10%, the market will be disappointed, and react accordingly. There will be new winners and losers this quarter. Be prepared to rotate sectors and stocks.